Wireless sensor networks to monitor the health of soil, waterways, the atmosphere and wildlife. Nature and technology are often portrayed as opposites, but the Internet of Things is bringing them together in a new kind of harmony. Networks of small, wireless sensors can be deployed in any ecosystem — oceans, forests, wetlands — while cloud-based data platforms connect researchers, conservationists and regulators to real-time data about the health of the environment. These systems not only increase our understanding of the ecology, but help protect plants, wildlife and humans, too. Learn about different kinds of environmental sensors and their application. 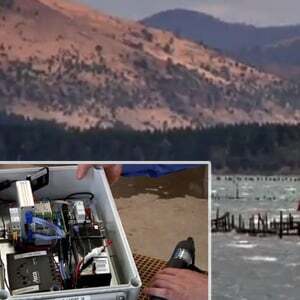 Discover projects that are using IoT technologies to study and monitor ecosystems. 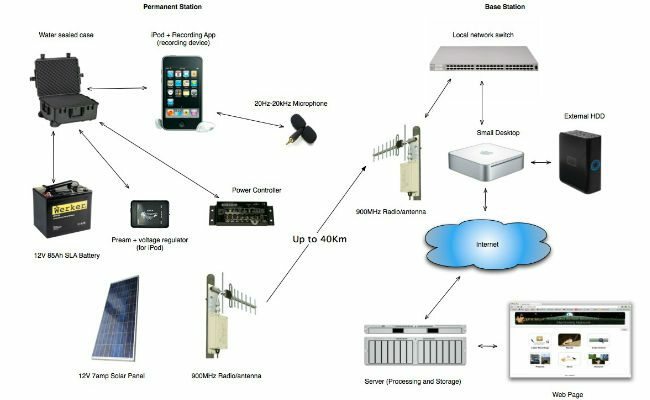 Identify the best tools and products for creating your own environmental monitoring network. 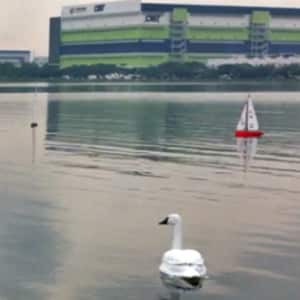 Researchers at the National University of Singapore have come up with a novel and discreet way to monitor water quality, especially in urban areas: robot swans. An environmental monitoring project that’s attempting to put the Savannah River Basin in the cloud. 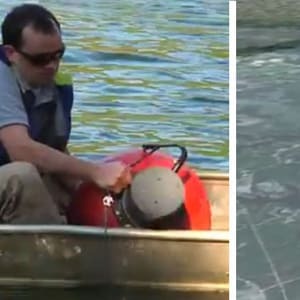 The Floating Sensor Network is a project by researchers at UC Berkeley that provides real-time, high-resolution data on waterways via a series of mobile sensing 'drifters' that are placed into the water and monitored by cell networks and short-range wireless radios. ARBIMON (Automated Remote Biodiversity Monitoring Network) is a project developed out of the University of Puerto Rico to help analyze an area's biodiversity..
Project aims to help optimize the health and production of oysters in the region. Seismic sensor networks are often the province of academia or government, but one Mexican startup is taking an entrepreneurial approach to providing early warning of earthquakes. 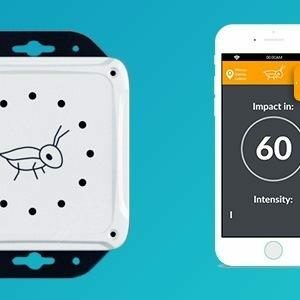 Grillo (which means ‘cricket’ in Spanish) is taking advantage of low-cost accelerometers and wireless modules to build affordable consumer devices that can both extend the earthquake detection network and act as an in-home alarm system when a quake is on its way. The Mexican government does have a seismograph network called SASMEX in place in the area surrounding Mexico City, which has unusual geology that makes it extremely vulnerable to earthquakes. When a quake is detected, emergency alerts are broadcast on radio and television, but the officialSARMEX devices that can receive a direct signal and sound the alarm often cost upwards of 18,000 pesos ($1,000). Grillo’s boxy devices, by contrast, run closer to $50. Made with a custom circuit board design, they can receive the SASMEX signal, but also connect over Wi-Fi to Grillo’s cloud servers. Drawing on uploaded accelerometer data, Grillo can turn each device into a node in its own parallel seismic detector network — and can push its own alerts back to Grillo devices. A speaker and LED ring in each device provides a visual and auditory alarm that allows for precious seconds of preparation before a quake hits. Because it’s not tied to seismograph stations in a specific geographic area, Grillo’s alert system has the potential to go international. And you don’t have to pay for a device to take advantage of the early warning network; the company is planning to offer free alerts, presumably via an app, to anyone who requests them (though factors like network coverage may man the message won’t reach you as quickly as it would with a dedicated device). Grillo crowdfunded an initial run of its devices in Mexico, and is now working on an updated version for the global market that will take full advantage of the cloud. In October 2015 the company received a $150,000 grant from USAID’s Development Innovation Ventures program. Learn more about Grillo in the video below. Just a few years ago, the idea of a “personal seismograph” would have seemed ridiculous — most of us aren’t geophysicists, after all, and what good is earthquake data to the average consumer? 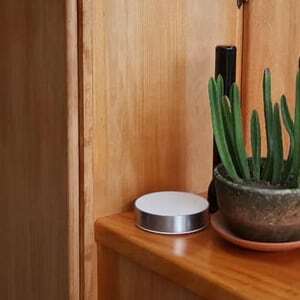 But as the Internet of Things has introduced us to a host of new, inexpensive sensors for collecting and sharing data about the physical world, it’s starting to seem plausible that an in-home earthquake detector could be just as fundamental as a fire alarm. Seismographs traditionally are complex, delicate scientific instruments that can cost tens of thousands of dollars. But OSOP, which has made that kind of equipment for years, is now running an Indiegogo campaign for Brinco — a consumer-friendly device that leverages a custom-built motion sensor alongside the power of the IoT, to create a crowdsourced early warning network for earthquakes — and it costs less than $200. All a user needs is a flat surface, a power outlet, and a Wi-Fi network. Once configured, the device maintains a constant connection with the Brinco cloud servers, which collect anonymized seismography data from Brinco users as well as from government and academic sources. Because the seismic waves of an earthquake travel relatively slowly through the ground, the servers have a chance to detect that a quake has begun, calculate how far it will spread, and send near-instantaneous warnings to Brinco users in the affected areas. While those nearest the epicenter of a particular quake will still be caught unawares, Brinco users farther away will see flashing lights and hear a spoken warning about what to expect and when the quake will reach them. For earthquakes, even a few seconds of warning can allow someone to seek safety. In the case of a tsunami — the sudden rise in sea level that follows an undersea quake — the warning can come hours ahead of time. Brinco represents the best of what the IoT can be: A solution to a very real and age-old problem, made possible by the combination of inexpensive electronics and the global telecommunications network. With the devastation of recent quakes and tsunamis still fresh in our collective memory, the value of a robust, reliable early warning system is undeniable. Now that the technology is cheap enough to create a distributed network of seismograph-alarms, it may actually be feasible for municipalities in earthquake-prone regions to start requiring systems like Brinco in their building codes. Brinco’s Indiegogo campaign runs through August 22, and the device is expected to ship in July 2016. Recognizing that those who would most benefit from an early warning system aren’t always those who can afford one, several of the reward tiers allow backers to provide Brincos to schools or individuals in earthquake zones around the world. 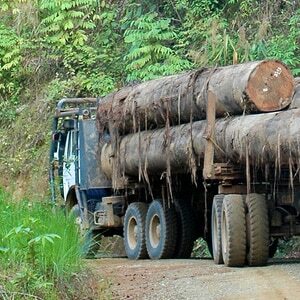 Invisible Tracck is a wireless device being used in pilot programs to help combat illegal deforestation taking place in the Amazon. Like the above title, you too can write about something interesting, suach as your team's interests or simply speak about the services or products you provide. Keep is short and precise. 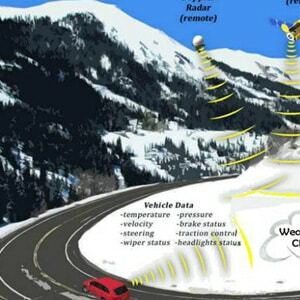 Weathercloud is a Boulder based company looking to improve road condition safety and traffic routing using a cloud service and data gathered from sensors installed on a vehicle's license plates. 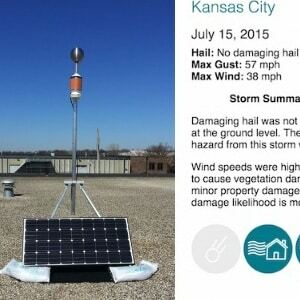 Understory is a weather data startup that uses solar-powered weather stations, calledRTi’s (“Arties”) to measure the three-dimensional forces acting on the equipment, as well as basic weather data like temperature, atmospheric pressure and sunlight. ARBIMON (Automated Remote Biodiversity Monitoring Network) is a project developed out of the University of Puerto Rico by Carlos Corrada-Bravo, Mitchell Aide and their team that uses off-the-shelf technology in combination with advanced machine-learning algorithms to help analyze an area’s biodiversity. At the core of the project are field monitoring stations that are created using solar panels, a 2nd generation iPod, 12v car battery, 900 MHz Radio/antenna, and a 20Hz-20kHZ microphone all wrapped up tightly in a waterproof case. The field systems capture one minute long recordings of an area every 10 minutes and then passes that data along to a base station (that can be located up to 40 kilometers away) to eventually reach the main projects server for analysis and backup. 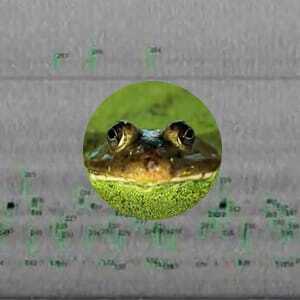 Once captured and stored the audio is processed against an automated species identification system and algorithms that has been trained by researchers based on specific vocalization of a species. 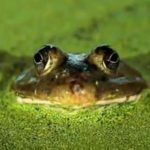 The ARBIMON team has created and tested species-specific models for a range of amphibians, birds, mammals, and insects. Once created these models can be can be used to process previously recorded audio to generate daily and monthly patterns for a specific species or a “soundscape index” for an entire area that can be tracked over time. You can check out a more detailed overview of the ARBIMON system at Arbimon.com/arbimon/ or read their latest research findings on the project at PeerJ. 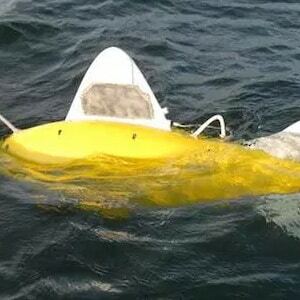 The Shoal project is a European 7th framework research initiative led by professor Huosheng Huand his team at the university of essex creating a new type of real-time harbour pollution monitoring system via robotic fish. where water quality monitoring is now dependent on human divers and laboratory testing that only occurs around once per month (and costs up to €100,000 per year to maintain). 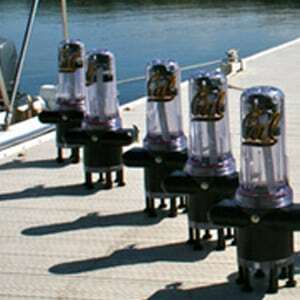 Outfitted with a sonar system for communication and a host of electrochemical sensors measuring heavy metals and water quality (Dissolved O2, Conductivity, ORP) levels the fish use their built-in swarm intelligence system to quickly narrow down the location and extent of the pollution source and send the information back to port authorities to take proper action. 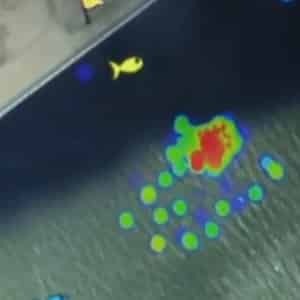 An infrared, GPS, and other sensor data also help the fish to measure their position, heading, speed etc and ensure that the fish are not stolen or damaged. Although still in development mode the project coordinators would eventually like to commercialize the project and sell these systems to ports throughout the EU and the world. 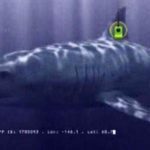 In our post about Wolfram Connected Devices and Thingful the other day we, speculated about whether the average person could find a use for data about the precise location of a shark (aside from marine biology research, of course). Well, it turns out the Department of Fisheries of Western Australia beat us to the punch: they put the sharks on Twitter. 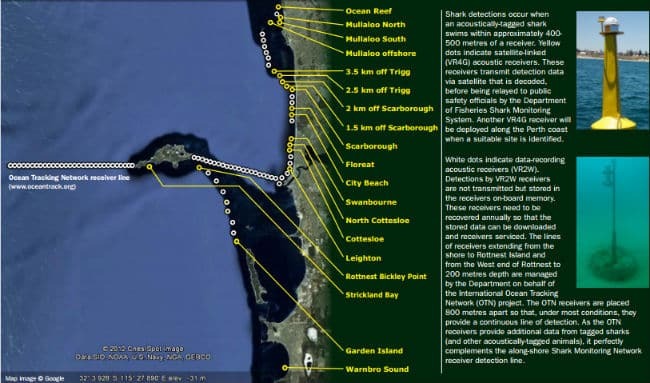 The department’s shark monitoring network uses long-lasting acoustic tags to keep track of sharks. As the name implies, the tags use sound to broadcast the shark’s location in the water. A network of listening stations along the coastline sends updates by satellite connection whenever a shark comes near. That triggers an automatic tweet from Surf Life Saving Western Australia, a non-profit group that also tweets about shark sightings from helicopter patrols, calls to the Water Police tipline, and other sources. 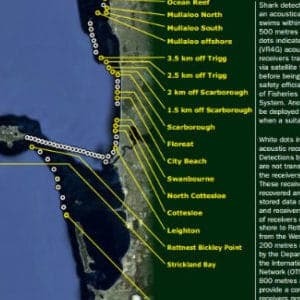 More than 300 sharks have been tagged, and there are several dozen satellite-linked listening stations installed so far from Perth down to the southern coast. In addition to warning surfers and beach-goers, the network is gathering valuable data about the size and movement of shark populations. The majority of the more than 160 shark species native to Australia pose little risk to humans. Common species like hammerheads generally bite only when threatened, and their bites are rarely fatal. Only three species are significantly dangerous: bull sharks; great whites; and tiger sharks, like the one(s) that tweeted from listening stations near Perth almost every day last week. Tags and tweets are not a perfect system, however. The listening stations have a limited range, and there are untold thousands of sharks of all species that haven’t been tagged. So the fact that there hasn’t been a tweet doesn’t mean the beach is safe. On the other hand, the presence of a shark — even a tiger, bull or great white — doesn’t mean an attack is imminent. Shark attacks, while terrifying, are still very rare. WA Todayrecorded only a handful of attacks in Western Australia last year. But to minimize that risk even further, Surf Life Saving has plenty of safety tips. The next time you’re at one of Western Australia’s beaches, keep them in mind — and keep an eye on your Twitter feed. 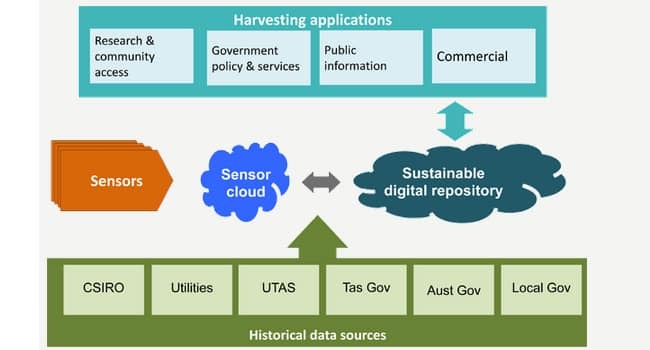 The SenseT (Sensing Tasmania) project is a collaboration between the Tasmanian and Australian government, local universities (UTAS and University of Melbourne’s Institute for a Broadband-Enabled Society), and businesses including IBM to deploy networks of environmental sensors across the entire state of Tasmania. Connected via a new broadband network the $42 million project combines historical, and real-time sensor data and makes this information available for public usa via API’s and an app-store. 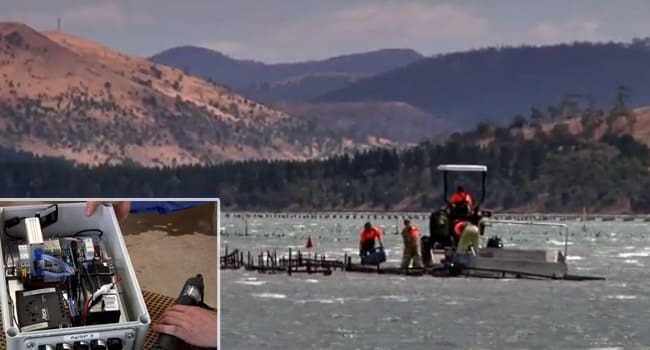 One of the latest projects from SenseT is OysTag, a Aquaculture Biosensors project that aims to help optimize the health and production of oysters in the region. Large sensor devices are deployed in the farms to measure general environmental conditions like temperature, and salinity levels of the water. 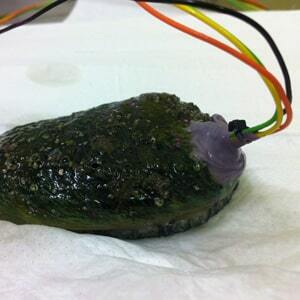 Small Biotags are also being attached to individual oysters to detect the current depth of the creature, its movement, how much ambient light it is receiving and even the heart rate of the animal. This data can be aggregated and used to predict the growth rate, feeding behavior and details on how to optimize conditions for healthier animals and deliver safer and more productive crops for individual farms and across the industry as a whole. More details about the project can be found at: Sense-t.org.au or by watching the video below created by CSIRO (Commonwealth Scientific and Industrial Research Organisation). The TOPP (Tagging of Pacific Predators) project began in 2000 as part of a 10-year, 80-nation “Census of Marine Life” research study to help better understand and protect how life is actually operating in the world’s oceans. The program is currently managed by NOAA’s Pacific Fisheries Ecosystems Lab, Stanford’s Hopkins Marine Lab, and the UC Santa Cruz Long Marine Laboratory and has tagged more than 4,000 individual animals across 23 species of predators that inhabit the Pacific Ocean with biologging sensors and tracking technologies. – These tags can last up to 10 years and are surgically implanted. The tags can record pressure (for depth), ambient light (to estimate location), speed of travel and internal/external body temperatures. – These temporary tags have a battery life of around two weeks and can be released from an animal at a pre-set time (30, 60, or 90 days). They are used mainly on animals that don’t spend much time on the water’s surface and are able to collect data on pressure, ambient light and internal and external body temperatures. 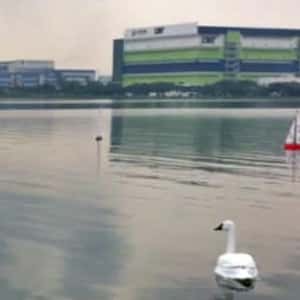 – Designed for animals living near the surface this tag can last up to two years and is designed to transmit its sensor data after the antenna of the device breaks the surface of the water. The data includes speed, pressure, water temperature and location data calculated by Doppler shifts in the transmission signal over time. – These tags compress data for more efficient transmission to the Argos satellite. They can be combined with CTD tags to record temperature, depth & salinity profiles. Once attached to the animals the tags send their location and sensor data to the Argos satellite (which is dedicated only to monitoring data focused on environmental research and protection) orbiting 850 km above the earth for the scientists to access. TOPP researchers then combine this information with other sea surface temperature maps and current chlorophyll location models to help them study specific species migration patterns, better manage fisheries, and help define management policies to protect the animals from being caught in nets or other industry activities. Engineering has provided the biologging community with ever more sophisticated tags, and advances in the application of statistical methods to interpret these data have yielded powerful new tools for understanding animal behavior. The technology has also reached sufficient sophistication and reliability such that the data collected is often equivalent to industry standards for environmental sampling, which has led to profound advancements in the marine realm, where the sheer vastness, in 3 dimensions, limits our ability to observe. Biologging data is now being increasingly applied to marine management and conservation policy. The Internet of Things has given a real boost to “citizen science” by putting low-cost sensors and computer chips in the hands of creative tinkerers everywhere. Take, for example, the latest project from Romanian maker Radu Motisan: a handheld air quality monitor that scans for pollution and radioactivity. The Portable Environmental Monitor is Motisan’s entry for the 2015 Hackaday Prize, which answers the challenge to “Build something that matters.” Having previously created uRADMonitor, a radiation-detecting device and global reporting network that was a Hackaday semifinalist last year, it was a natural evolution to build on the worldwide infrastructure and offer a more flexible way to monitor health risks in our environment. Stuffed into the prototype’s aluminum enclosure are an ATmega128 microcontroller, rechargeable battery, 2.4-inch LCD touchscreen, ESP8266 Wi-Fi module, and a suite of sensors — which can detect temperature and pressure, dust, carbon dioxide, volatile organic compounds, and three kinds of harmful radiation (alpha, beta and gamma). 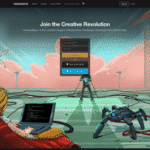 The device is controlled through a custom interface, the code for which is available as open-source software. 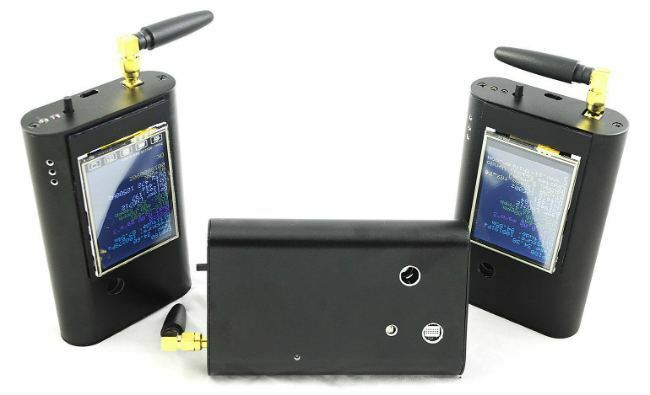 Data from each Portable Environmental Monitor unit is streamed to a server where it can be mapped and combined with data from the uRADMonitor network, allowing citizen scientists around the world to collaborate on a vast, crowdsourced dataset of global air quality and radiation measurements. Check out the video below to learn more and see how the prototype works.